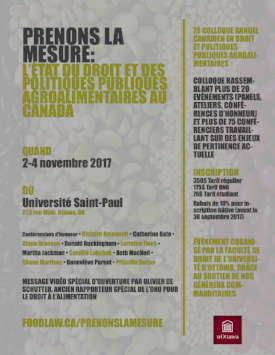 Food law and policy is just starting to emerge as both a field and area of practice in Canada. But what is the field and practice of food law and policy? And what benefit does this emerging field provide to scholars and practitioners? Today the practice and study of law and policy as it relates to the governance of food systems is fragmented. Our food systems are governed in silos. And we practice and study in silos. Agricultural law governs agriculture, food safety law governs food safety, health law governs health care and health regulations, trade law trade and so on. Law schools offer courses in these different areas, and lawyers practice, attend CPDs or work in ministries or governmental departments divided into these areas. There is little space and little opportunity to think across them. Those attempting to build the field and practice of food law and policy seek to break out of these silos. There are many reasons to do so. First, and at a minimum, creating a field or practice of food law and policy provides opportunity to build a community of scholars and practitioners with shared interests in the various ways our food system (or a part of the food system) is governed, to learn from one another and to create spaces for collaboration. Second, and more fundamentally, developing the field of food law and policy provides a unique opportunity to transform how we think about and ultimately govern the food system. Thinking in terms of and working in food law and policy pushes us to reflect systemically and holistically on how the food system as a whole is governed, rather than in individual silos, and in turn to build food law and policy from a systemic and holistic perspective. (d) Across legal, regulatory and policy instruments: across the various governance mechanisms from legislation, regulation and policy, to human rights commissions and other administrative bodies. Through thinking and working across these axes we can start to see a quilt of intersecting regimes that impact how food is produced (and what is produced), processed, distributed, purchased, consumed, protected and disposed of and the role of law and policy in all of this. We can see how policies at one end of the supply chain or in one ministry or jurisdiction impact other parts of the food system, where incongruences arise and where coherence may be beneficial. This improves the services we can provide our clients, and our ability to study, understand and offer scholarly interjections into food system governance. Finally, developing the field of food law and policy pushes us to question what values and goals currently underpin the governance of our food system, what values and goals we would like to see at the heart of food system governance and how we might change the governance mechanisms, laws, regulations and policies in place to build a better food system. We may all want different things – a more sustainable food system, a more just food system, a safer food system, a more profitable food system, etc. – but food law and policy as a field and area of practice provides a lens, opportunity and means to get at these goals in a meaningful way. 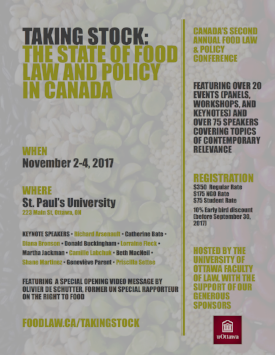 The upcoming 2nd annual Canadian food law & policy conference, Taking Stock: the State of Food Law and Policy in Canada, seeks to contribute to the development of this field and area of practice. It will be held at the University of Ottawa from November 2nd to 4th. At the conference, we will also make steps to establish a national food law and policy organization to continue collaboration and development of the field/practice in the future. We hope this blog will also contribute to the development! Please consider contributing to the blog and we look forward to hopefully to seeing you soon in Ottawa! Nadia Lambek is an SJD candidate at the University of Toronto Faculty of Law and a member of the Taking Stock organizing committee. She is also adjunct faculty at Vermont Law School and co-editor of Rethinking Food Systems: Structural Challenges, New Strategies and the Law (Springer, 2014).